I used approximately 40gm unknown green 8ply (DK) wool for the background and scraps of various colours for the stripes. Repeat these stripes 5 times, then work 9 rows background colour. Cast off. 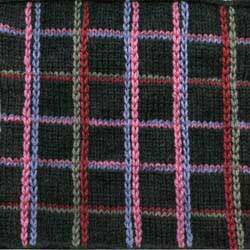 Work vertical stripes using chain st embroidery, matching the colours to the horizontal stripes. Begin at the centre and work, leaving 6 sts between each set of vertical stripes.